Can You Substitute Anything for Egg Dip When Frying? Coat dumplings in an oily vinaigrette to help the coating stick. Breading meats adds a satisfying crunch and locks in moisture during cooking. Raw, beaten eggs are often used to help breading stick to the item, but eggs aren't always an option. If you have an allergy to eggs or simply don't have them on hand, you can use some substitutes to help the breading stick. 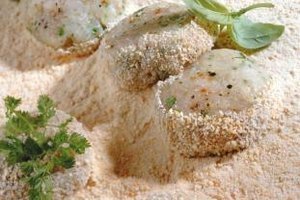 Milk and yogurt can be used to help breading stick to the food items you are trying to coat. Add enough milk or yogurt to a bowl and submerge the item before rolling it in the breading. You can thin out thick yogurts by adding a splash of milk. You can also use olive oil or melted butter to help breading stick, which have the added bonus of lending flavors to your food. To help heavier coatings stick, dip the food item in flour before submerging in the egg substitute. TheKitchn: Ideas for Breading That Doesn't Use Eggs?